Since 1997 members of the club and other volunteers have been active in the field. Volunteers have braved wind, rain, snow, cold waters and slippery rocks to perform the activities listed below. All agree however, that the effort is worth it. At times it is difficult to arrange schedules around the fish. When fish are ready be stocked, they cannot be delayed. To all of the members and volunteers who have taken time to participated in these activities, the club would like to give thanks. To see some of club's activities, just click on the highlighted areas below. Club members transported Atlantic salmon fry from the Grand Isle Hatchery in Vermont to Camden where they were placed in 10 different sites in the Mad river. Club members packaged the fish at the Beaverkill Trout Hatchery, transported them to Taberg where they met other members to help place the fish in 11 different sites on the East Branch of Fish Creek. Club members set up its booth at the Camping and Outdoor Sports Show held in Utica. The club met with representatives from Save Our Streams. The club will be help the project by helping monitor Fish Creek. Further meetings will be held. Club members assisted the Camden Rod and Gun Club by working in the kitchen for the Sunday morning breakfasts. Many thanks go to the Camden Rod and Gun Club for allowing the club to use its excellent facilities. The club set its booth at the Fragile Wilderness Show held in Watertown, NY. About 40,000 eyed (fertilized) eggs were delivered to the Beaverkill Trout Hatchery. Another 1500 were delivered to Paul Miller who placed them in the tank installed at Tkachuks. The club's stainless steel tank was installed at Tkachuks. An experimental 1500 eggs will be used to test the water quality from the spring. Water was diverted to flow through the tank. 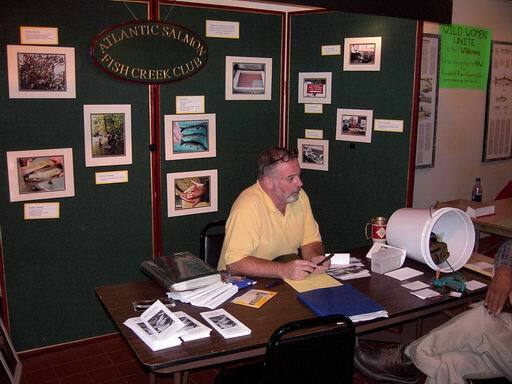 The club voted to change the name of the club from The Atlantic Salmon Fish Creek Club to the Fish Creek Atlantic Salmon Club. The club held a banquet for its members. Members met with Milt Franson to iron out some details of the sale of his print. Milton Franson, a commercial artist, attended the montly meeting and proposed that he share the profits of the marketing of one of his prints of Atlantic Salmon. The club agreed. Details will be worked out later. Members met at Allen's again and finished waxing the mold. Club members met at Allen's home and worked on the Adirondack guide boat project. Three coats of wax was applied to the mold. Fixtures were made to hold the rails that will support the seats. Members met at the shop where the mold for the Adirondack guide boat was being repaired. It was placed on a trailer and moved to Allen's barn. 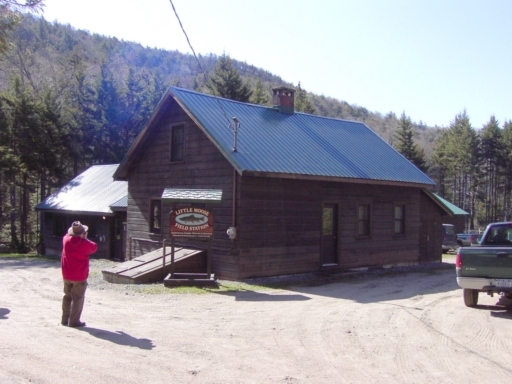 Club members toured the Adirondack Museum located in Blue Mountain Lake. The club had a guide tour of the warehouse with the emphasis on Adirondack Guide Boats. The club toured the main museum afterwards. Club members set up its booth at the Fish Creek Salmon Restoration meeting held at the Verona Beach State Park. Club members made presentations to the group and several lively discussions developed. The club stocked some 20,000 Atlantic salmon fry donated by the hatchery in Vermont. Club members went to Vermont to transport the fish to Taberg. At the end of the week one of the club members took a tank back to Vermont used to transport eh fish. Club members and volunteers stocked some 35,000 Atlantic salmon in Fish Creek. Three members went to the Beaverkill Trout Hatchery on June 6 to package the fish for delivery. Club members stocked the Atlantic salmon from Carpenters Brook Fish Hatchery. Due to tragic circumstances, not many of the original fish survived. 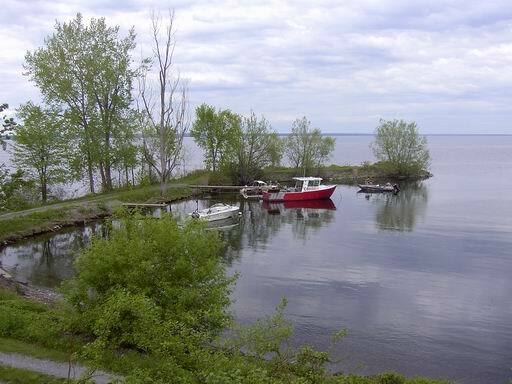 The club held its monthly meeting at the Cornell Field Extension at Shackleton Point on Oneida lake. Members toured the facility with Ed Mills. Ed explained the work being done at the facility and what the future plans might be. A few club members traveled to Cornell University's Little Moose Research station near Old Forge, NY. The club met with Daniel Josephson, Research Associate with the Adirondack Fishery Research Program of Cornell University. Dan was very cooperative and supportive of the club's activities. 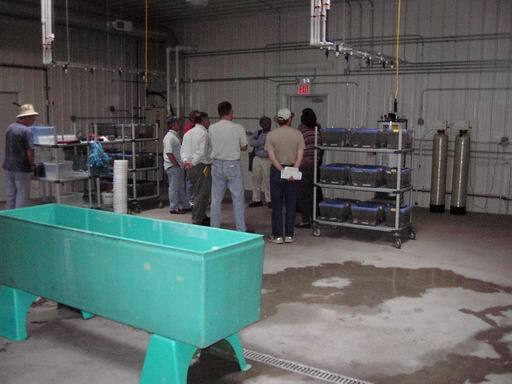 Members were shown the hatchery facilities and Dan explained the operation as the group toured the facility. The club pulled the winning tickets to the club's raffle. Congratulations to the winners! Because of the number of reports being received about Atlantic salmon being caught by fishermen it was decided to distribute posters of area bait shops identifying Atlantic salmon. The club set up its booth at the CNY Camping and Outdoor Show held in Utica, NY. About 15,000 Atlantic salmon eggs were delivered to the Carpenters Brook Fish Hatchery in Elbridge, NY. Club personnel were on hand to assist the operation. A schedule has been set in place for club members to pick out bad eggs. The club set up its booth at the Trout About held at the Sheraton Inn in Liverpool, NY. Members sold raffle tickets and explained the club's work. Reports continue to flow in about Atlantic salmon being caught through the ice on Oneida lake. 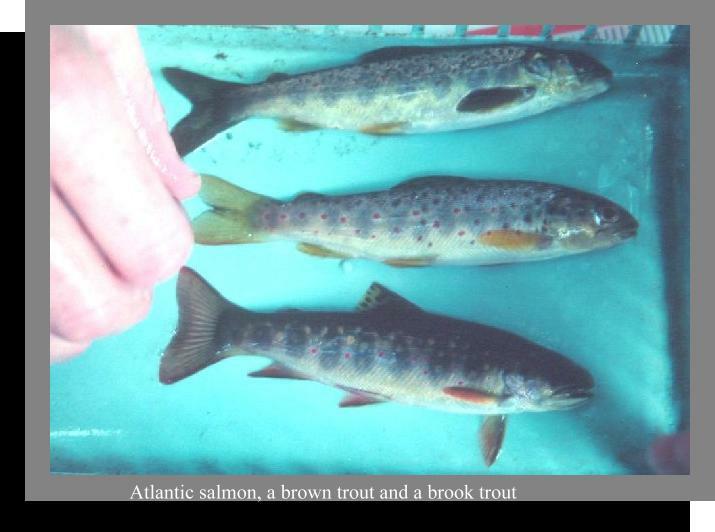 About 35,000 Sebago strain Atlantic salmon eggs were delivered to the Beaverkill Trout Hatchery. The club set up its booth for the Fragile Wilderness Show in Watertown. The club installed its stainless steel tank at Carpenters Brook Fish Hatchery. Complications arose getting the protective paper off the tank. Installation completed Feb 9. It was reported that an Atlantic salmon was caught through the ice on Oneida lake. Raffle tickets were sent out to club members. Club members received copies of the stocking permit. The Catskill Trout Hatchery received 20,000 Atlantic Salmon eggs to hatch for the club. The eggs arrived in great shape. About 20,000 Atlantic salmon eggs were delivered to the Carpenter's Brook Hatchery. The club manned a booth at the Fragile Wilderness Show in Watertown. Members sold raffle tickets. The club manned a booth at the Utica Outdoor Show and sold raffle tickets to pay for Atlantic Salmon eggs. The club drew the names of the winners for raffle. 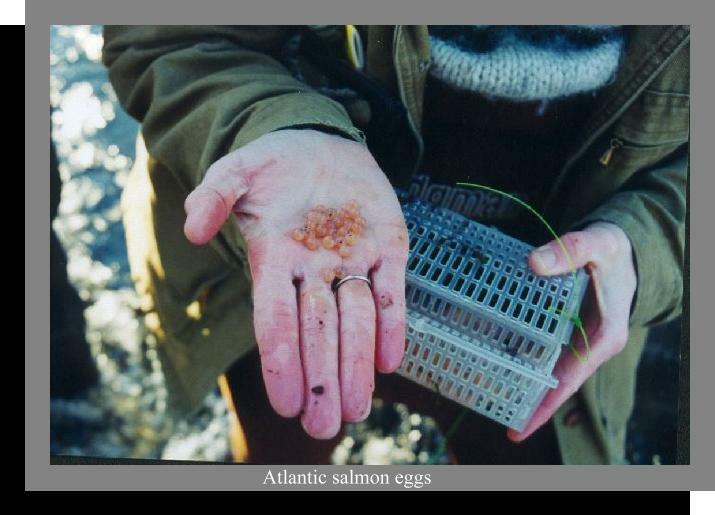 The club authorized payment of $1610 for the 40,000 Atlantic salmon eggs delivered in 2002. Club members gathered at Taberg to help stock 20,000 Atlantic salmon fry into the East Branch of Fish Creek in 10 different sites. Two members went to the Catskill Trout Hatchery to package and deliver the fish. Afterwards, club members gathered for a picnic on the river. Club members went to Carpenter's Brook Hatchery and packaged 10,000 Atlantic salmon fry for stocking into Fish Creek. Some of the fry went into Point Rock Creek. Club members caught a number of Atlantic salmon, inserted an identification tag and released them into the East Branch of Fish Creek. The size of the fish ranged from 157 to 206 millimeters long. Club members met on the East Branch of Fish Creek to catch Atlantic salmon for the purpose of inserting tags for our on-going study. A total of 12 fish were caught and released. None were tagged as they were judged to be too small to be tagged. All of the fish caught were one-year olds. The club recovered an Atlantic salmon netted by the Cornell Extension at Shackleton Point in 30 feet of water. Club members voted to purchase a canoe for the raffle. Paul Miller placed an order of 50,000 Atlantic salmon eggs from the Maine hatchery. The perferred strain is Sebago although Grand Lakes strain would be acceptable. Club members manned the club's booth at the open house at the Altmar Hatchery. It was reported that a fisherman had caught an 18 inch Atlantic salmon in Oneida lake at the mouth of Scriba creek. The club sent a letter to the hatchery in Maine that we would like to buy 50,000 salmon eggs this year. The club kicked off the guide boat project. The club kicked off its annual raffle. The raffle will be held at the club meeting on April 24, 2003. 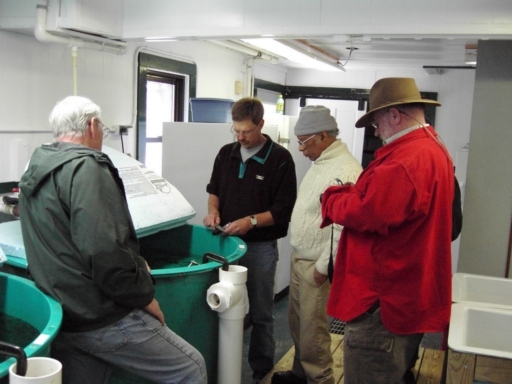 Club members installed a stainless steel tank at the Beaverkill Trout Hatchery. This tank will be used to hatch Atlantic salmon eggs. The eggs will be delivered during the first week of February. We will be getting the Grand Lakes strain. If everything goes well, the club expects to place the fry into the water in May. Club members attended the Trout About. Club members attended the North East Fish and Wildlife Conference in Saratoga. New at the conference was a booth designed and built by club members. The club realized one its goals when club members and members from the Iroquois Chapter of Trout Unlimited stocked 10 different sites on the East Branch of Fish Creek with Atlantic Salmon fry. Club members traveled to Lewbeach, NY to bag and transport the fish to Taberg. The fish arrived in good shape. In spite of some rain everybody seemed enthusiastic and the stocking went smoothly. 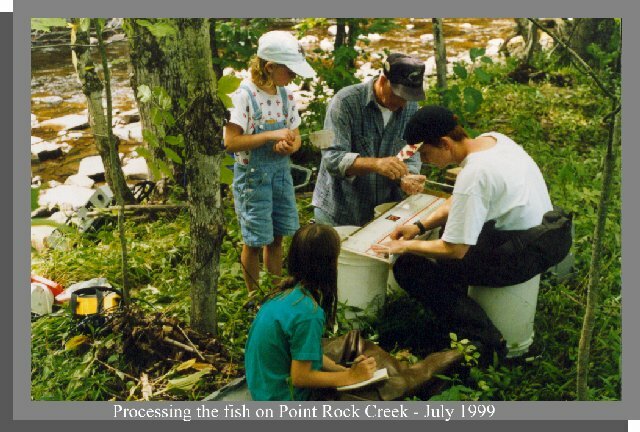 The club started this project in January 2000 when it was decided to investigate our own sources of Atlantic salmon fry rather than depend of an agency. Eggs were purchased by the club from the Maine Department of Fish and Wildlife. The fry was hatched at the Beaverkill Trout Hatchery for the club. The club placed another 20,000 Atlantic salmon fry into the East Branch of Fish Creek. The fry came from the Vermont Fish and Wildlife department. Members of the club electro-shocked one of the sites that were stocked on May 30. A number of Atlantic salmon were recovered. The club was notified that someone had caught an Atlantic salmon below the Caughdenoy dam. A member of the club obtained the fish for further study. The fish was photographed for verification and scale samples were taken to determine the age of the fish. This fish is probably one of the fish stocked in Fish Creek by the club. Club members participated in a "Fish day" on the East Branch of Fish Creek. The aim was to catch Atlantic salmon by angling for the purpose of tagging fish for later identification and study. No salmon were caught but fun was had by all. Another "Fish day" will be scheduled in a different section of the river. An Atlantic salmon was caught by a gill net off Shackleton Point on July 17 by workers for the Cornell Extension. The fish measured 303 mm and weighted 227 grams. A club member has obtained the fish for further study. It was reported to the club that three more Atlantic salmon were caught in the Oneida river system. Two were electro-shocked by federal employees in Cowaselon creek which flows into Oneida lake via Canaseraga creek at Lakeport. The fish were first identified as rainbow trout but were corrected by someone with knowledge of Atlantic salmon. The club set up and manned a booth at the open house at the Atmar Hatchery. Club members went to the Carpenters Brook Hatchery to discuss the hatching of salmon eggs for the club. 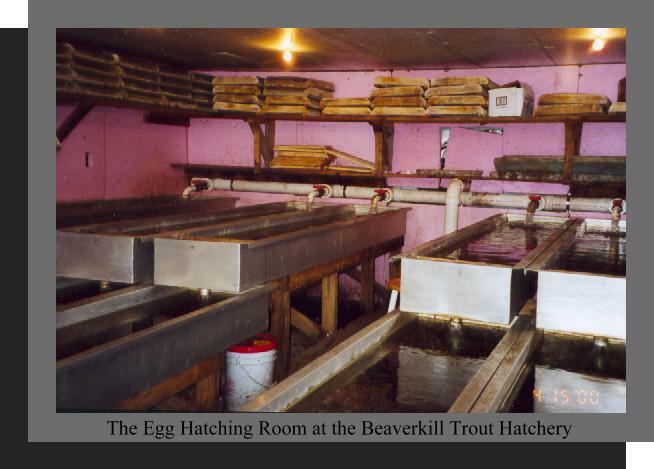 Alan in our monthly meeting said that he made contact with the Beaverkill Trout Hatchery. They volunteered to hatch eggs for the club if we could supply the eggs and a stainless steel tank. Bruce said in our monthly meeting that a surplus stainless steel tank was surplused and that we could possibly get it if we applied for it. 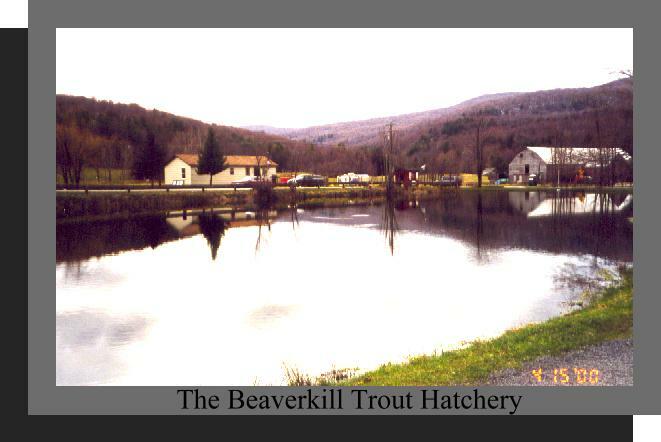 A trip to the Beaverkill Trout Hatchery is planned for April 8. The tank from Griffis AFB is ours if nobody in the Air Force needs it. Allen talked about his trip to the Beaverkill Trout Hatchery . 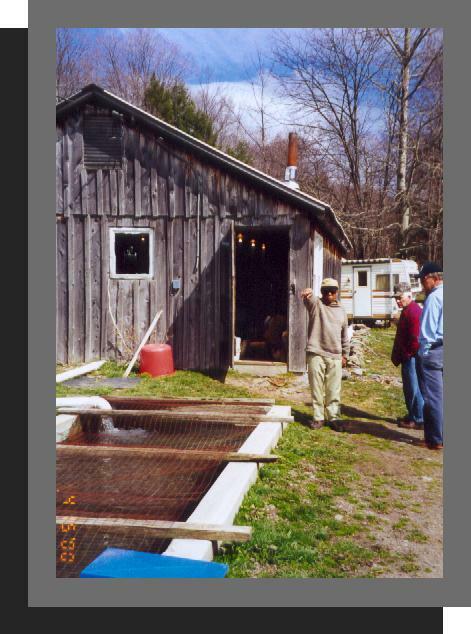 The hatchery (home of the famous trout herding dogs) is privately owned and operated and is the only private hatchery licensed in New York able to place fish in public streams. Club members viewed the room where the eggs are to be hatched. 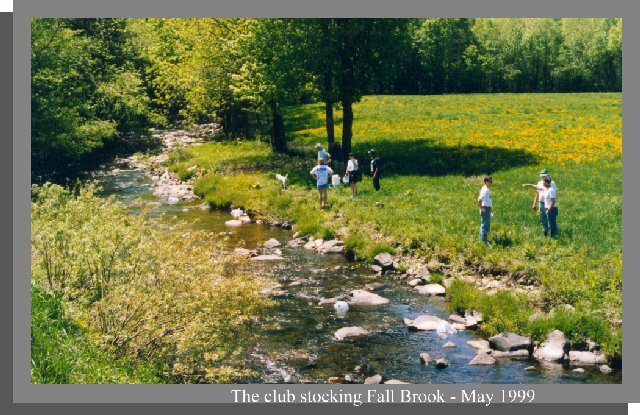 The club stocked 30,000 Atlantic salmon fry in Little Salmon River and Little Sandy Creek and 30,000 Atlantic salmon fry in the Mad River, the Little River, Fall Brook and Point Rock Creek. Margaret Murphy and her associate conducted a drift study. This showed that some fry will drift downstream from the initial stocking site. The second stocking had fish that had been marked by the hatchery. The temperature of the water was changed while the fish were in the tanks. This produces a ring on the developing ear bone of the fish which can be seen when examined under a microscope. For our monthly meeting, the club met at Margaret Murphy's laboratory. 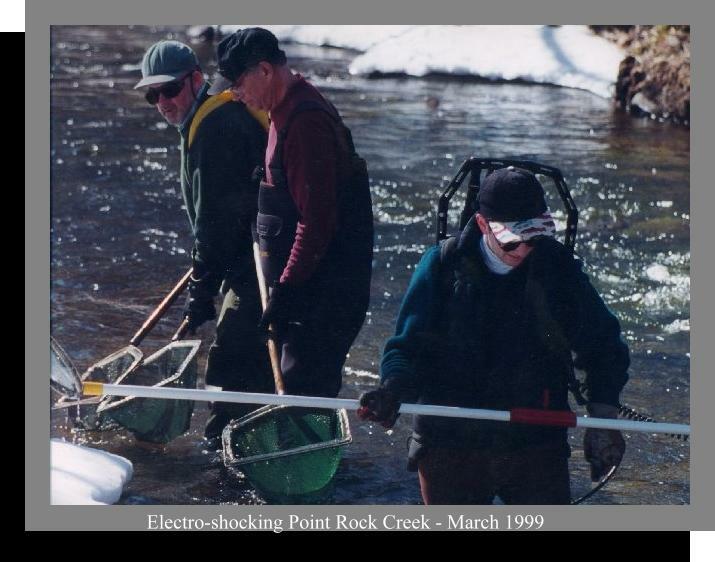 Margaret reported that the fish electro shocked in Point Rock Creek were 4 times as big as the ones she raised in the lab from the same batch of fry. The tank is ours! 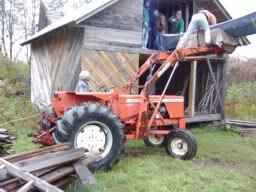 The club met to move it to a place so that needed modifications can be made. Modifications to the tank have been completed. Installation is tentatively scheduled for December 16. Discussions were held at our monthly meeting about how to raise money to buy eggs. Eggs from the hatchery in Maine are $40 per 1000. Club members went to one of the sites on the Mad River containing Whitlock-Vibert boxes. Two boxes were found and the eggs examined. Both boxes contained viable, healthy eggs. One of the boxes contained some silt but the second had none. The club electro-shocked a portion of Point Rock Creek . A total of 19 Atlantic salmon were found ranging in size from 90 mm to 162 mm, the average being 105.7 mm. Club members met at the sites on the Mad River in an attempt to find the Whitlock-Vibert boxes that were placed there in December, 1999. At two sites only one box was found due to instability in the banks upstream from the site. All of the eggs had hatched in the one box found and a few fry were found still inside. In the third site all but one box was found. All eggs were hatched. At the fourth site about half of the boxes were found and all eggs had hatched. The club placed 30,000 Atlantic salmon fry into the waters of Point Rock Creek and Falls Brook. Two varieties of salmon were used: Grand Lakes and Penabscot. Club members will return in late July to electro-shock the sites to determine the result of the stocking. 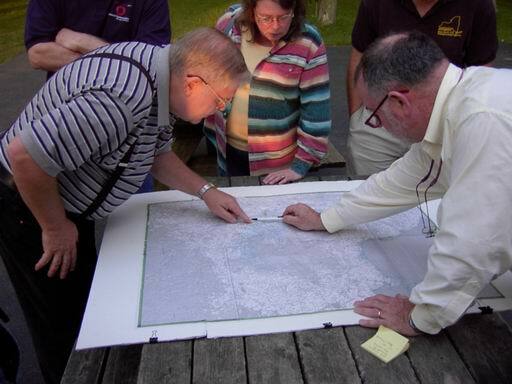 Club members met at the Mad River to locate the missing Whitlock-Vibert boxes placed in the water on December 1998. Club members had a metal detector in the hopes that the metal washers placed with the boxes would help in finding the boxes. Only one box was found visually. It was determined that the metal detector was not sensitive enough to detect the boxes. Club members assisted scientist Margaret Murphy in electro-shocking the sites where fry and eggs were stocked. Atlantic Salmon, brown trout and brook trout were found. Only a 50 meter length of each site was electro-shocked leaving a 50 meter section undisturbed. Salmon were found from the 1998 and 1999 stockings in some sites and none in others. The fish found were identified and counted. In addition the salmon and trout were each measured and weighted. Water levels of the streams rose as much as 4 feet from a thunderstorm that had passed over the area on the Independence Day weekend. It is unknown what effects the high water had on the salmon fry. The assumption is that some or most will be washed downstream depending on the type of cover each site affords. Margaret Murphy will make a presentation to the club at our normal club meeting in September. Club members assisted scientist Margaret Murphy in electro-shocking Point Rock Creek. Several salmon were found, measured, weighted and released back into the water. A number of mature males were found as well. Some of the larger salmon were marked for later identification by clipping part of a fin. A sample of some scales were taken from the older fish in order to verify their age. 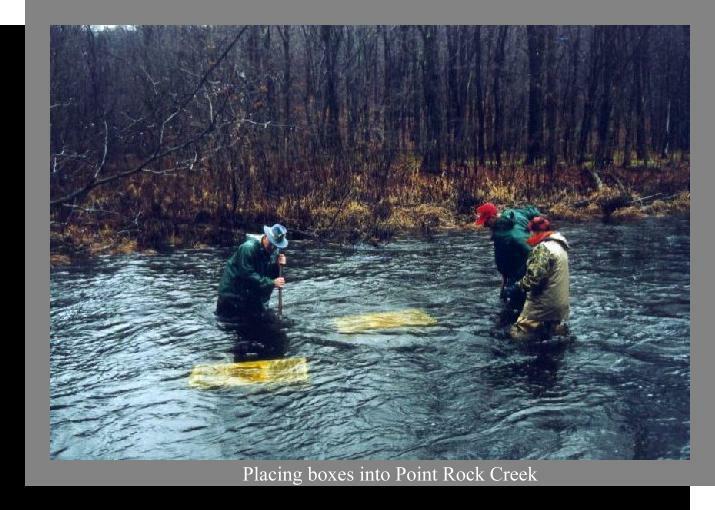 The club placed boxes into Point Rock Creek for the purpose of an over winter study. This study will provide data about the effects of winter on the salmon. Atlantic salmon will be obtained at a later date from the stream by electroshocking and placed in the boxes. During the winter, boxes will be pulled from the stream at regular intervals. The fish will be measured and weighted before being placed in the box and when taken out. The club searched the sites in the Mad River where the WhitlockVibert boxes were placed but found only three boxes. All of the boxes were filled with silt and the eggs were dead. The flood in January, 1998 altered the stream, sometimes to the point of being unrecognizable. Club members stocked tributaries of the East Branch of Fish Creek with 25,000 Atlantic salmon Fry of the Grand Lakes strain. The streams were: Furnace Creek, Florence Creek, Fall Brook, and Point Rock Creek. Club members electro-shocked the Mad River and the tributaries of the East Branch of Fish Creek. No Atlantic salmon were found in the Mad River where only eggs were placed. Atlantic salmon were found in the tributaries where fry were placed with the exception of Florence Creek. The results were excellent in Furnace Creek, Fall Brook and Point Rock Creek. In Point Rock creek one salmon was found from the previous year stocking. The fish were in excellent health and were returned to the streams unharmed. The length of the fish were between 70 and 90 millimeters. Club members escorted Bill Hooper and his associate Faye Cowie on a tour of Fish Creek. Bill and Faye are from New Brunswick, Canada where Bill was in charge of several Atlantic salmon Hatcheries for the Miramichi River system. Hooper spent 5 days in the area, evaluating Fish Creek for salmon habitat and restoration and attending the Atlantic salmon Workshop held in Syracuse, NY. The club hosted a public information conference in Camden. Bill Hooper was the featured Speaker. Club members stocked the Mad River at four different sites with 22,000 Atlantic salmon eggs contained in Whitlock-Vibert boxes. The eggs were obtained from the US Geologic Survey Tunision Aquatic Science Laboratory near Cortland NY. The eggs were of the Penabscot strain which is a "sea-run" fish. This effort made use of "eyed" eggs in which the embryo was visible. (a) Identifying each box by punching a number on a large iron washer attached to the box. (b) Tying a piece of line to the box to increase visibility. (c) Establishing the location of each box by measuring from each box to two stakes driven in the bank on either side of the stream. 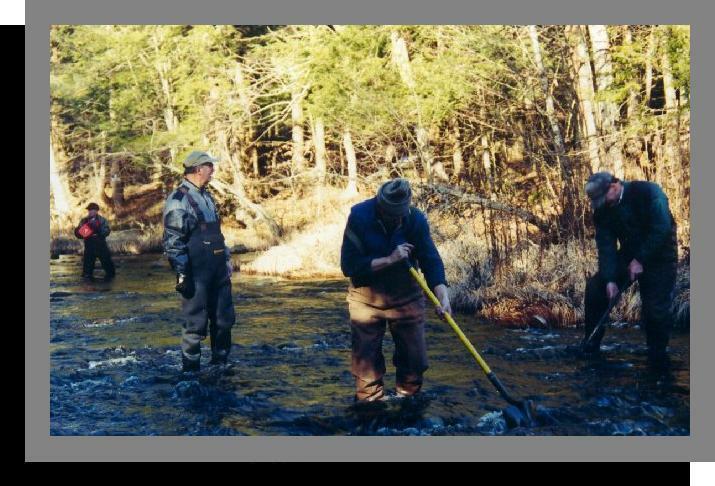 Approximately 11,000 Atlantic salmon fry were placed in tributaries of the East Branch of Fish Creek. D.E.C. personnel electo-shocked a section of Point Rock Creek and found 15 Atlantic salmon. Average length was 97 millimeters (3.4 inches). 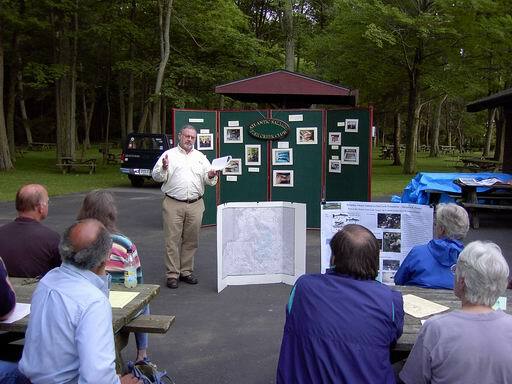 The club hosted the "Atlantic Salmon Workshop" held in Camden, NY. 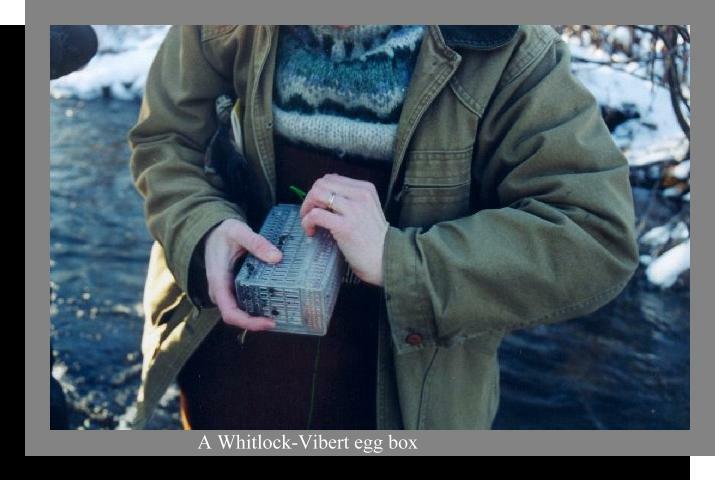 The club placed 80 Whitlock-Vibert boxes, each containing approximately 250 Atlantic salmon eggs into the Mad River, a tributary to the West Branch of Fish Creek.